We have a 10+ year old stereo receiver that I paid $1500 when I was a senior in college (and in all likelyhood paid several hundred more in interest in the years that followed). The motor that controls the volume knob on the stereo when you use the remote control has been on the fritz for over 4 years. Now, whenever the remote doesn’t work, I walk over and rap hard on the volume knob until the motor starts working again. We have a universal remote control that has truly lived up to its name: Harmony. Logitech makes a line of these remotes that allow not only my wife, but also anyone who visits our house the ability to turn the TV, stereo, DVD, VCR, Tivo, etc. on, off, change the channels, fast forward, etc., with little to no coaching in a very intuitive way. It even has a help button on it that gets things back on track if necessary. Over the last year or so some of the buttons have stopped working. As a stopgap measure I was able to reprogram some of the lesser used buttons to take over for some of the failing ones. As I look around our house, I see many items that we purchased when we made more money and had less expenses, items that put us in debt, or items whose purchase kept us from getting out of debt: laptops, a big screen TV, stereo, fancy universal remote control, espresso machine, air purifiers, exercise equipment, etc., etc. Some of these purchases are doing nothing but collecting dust, and that’s okay. We’re older, we’re wiser. Others, however, are essential, daily use items. The stereo and the remote are two examples, as is the TV. Someday these things are going to wear out, die, or otherwise stop working and require replacement. What I struggle with now is the question of what to replace these luxuries with. We have gotten used to having some expensive things, many of which we could not afford when we bought them — but now having done so, paid off the debt, and gotten on with life, find many of these items to be indispensable. When these items do inevitably die, do we “deserve” to replace them with like items? Do we need another 43″ TV? $1500 stereo? $600 coffee maker? Luckily for us, the nature of technology has made it such that we can buy replacements for many of these items that are many times better than what we’ve got now, and are also several times cheaper. An eight year old 43″ rear projection TV can be put to shame by a 40″ flat panel display for less than half the price paid for the original TV. 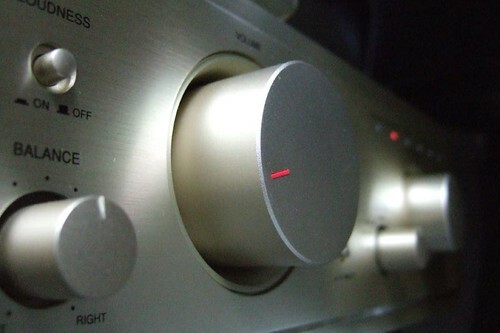 A similar cost reduction and improvement can be found in the stereo market. Yet despite the ability to replace many of these items with lower cost, higher quality products today, there is still the nag that I feel every time I start to spec out something like this. I always start to need this feature or that feature that I don’t have today, but can’t possibly imagine living without for the next 10 years. The truth is that many of the features that I overpaid for on these current items I don’t even use: 800 lines of resolution on my standard definition TV (nobody can even tell me how to take advantage of this…), 7 channel, multi-room capability on the “flagship” receiver, etc. Additionally, the cost bar has already been set high by these initial purchases, and since we’re in a better financial situation now than we were 5 or 10 years ago, the rationalization starts to creep in: Go ahead, by another $1500 receiver — you’re going to use it every day, you’re going to keep it for 10 years, it’s going to sound so much better than the $750 one — in fact, spend a little more this time since you’re so much better off. And herein lies the difficulty with keeping our financial house in order: we’re human and we have wants, dreams, desires, etc. It’s not easy to deny oneself the things one “deserves”. Many people have estimated what percentage of personal finance is math and what percent is psychology. All seem to agree that the former is low and the latter is high. All of this is not to say that if we have the money to do so (which we don’t at the moment), and that we’re meeting or exceeding all of our other personal finance goals, that we should not buy whatever we want. We most definitely should. But that still doesn’t mean that we should not approach the replacement of items like this with frugality in mind. We’re still going to end up with products that are better by our standards than the items that need replacing, but avoiding lifestyle inflation will keep more of our hard earned money in our pockets and working even harder for us on our other financial goals. I hope that when the time comes we’ll have the discipline we need to remember this. Have you ever been faced with replacing an item that you couldn’t afford the first time? How do you avoid the urge to buy more features than you really need? This entry was posted on Wednesday, November 19th, 2008 at 12:23 am	and is filed under Debt, Planning, Social Psychology, frugal. Both comments and pings are currently closed.